The Village of Sharon Springs gained international fame through the popularity of its mineral waters. Here, amid picturesque surroundings, visitors found relief from pain of arthritis, rheumatism, and a myriad of other ailments. Springs of mineral water gush forth from the hillside to merge with the waters of Brimstone Creek. They continue to tumble through the ravine, eventually merging with the Mohawk River. The white Sulphur springs, which emits the strong smell of decayed eggs, is the most noted spring. The flow of the water is approximately ninety-six gallons per minute with a temperature of 48 degrees’ Fahrenheit year round. The water is clear and bright as it bubbles form the earth, without the roughness or acidity that tends to make some Sulphur waters exceedingly unpleasant to the taste. Compared with the analysis of other Sulphur springs in the country, those of Sharon Springs are considered exceptional. Sulphur water was used both internally and externally. Some patients bathed in slate tubs with heated Sulphur water for skin and arthritic conditions. Others drank the water for a variety of internal disorders, such as “malarial difficulties” and “biliary derangements.” Inhaling fumes from heated Sulphur water treated pulmonary disorders. The temple over the Sulphur springs has been rebuilt a number of times. The current beaux-art style temple was built in 1927. Earlier temples, simpler in design, were made of wood. This early photograph shows the Lower Sulphur Bathhouse, located on the west cheap imitation harry winston side of Main Street. It was built in 1876 with two parallel bathhouses. Visitors to the complex could enjoy a Sulphur bath or take a drink of the Sulphur water from the adjacent temple. This early photograph shows the Lower Sulphur Bathhouse, located on the west side of Main Street. It was built in 1876 with two parallel bathhouses. Visitors to the complex could enjoy a Sulphur bath or take a drink of the Sulphur water from the adjacent temple. Medical treatments in the late 1880’s relied heavily on non-invasive methods Surgery was not a common procedure. Doctors and their patients believed that anything smelling as foul and tasting as vile as the mineral waters had to be good for one. Physicians prescribed treatments for replica watches shop a wide variety of ailments and an expert staff of technicians carried out their instructions. Gallbladder ailments required colonic irrigations with natural magnesia water. Lung diseases and hay fever were treated with inhalation of Sulphur and imported pine needle oil vapors. Even skin problems were treated both internally and externally. Hot Sulphur packs were used to relieve rheumatic fever. Steam massage and hot dry air were used for the treatment of rheumatism, gout, diseases of respiratory organs, malaria, and heart disease. As the demand for mineral water therapy grew, additional bathhouses were needed to cater to the needs of the visiting public. A map, dated 1904, shows a bathhouse annex added to the Park Hotel. 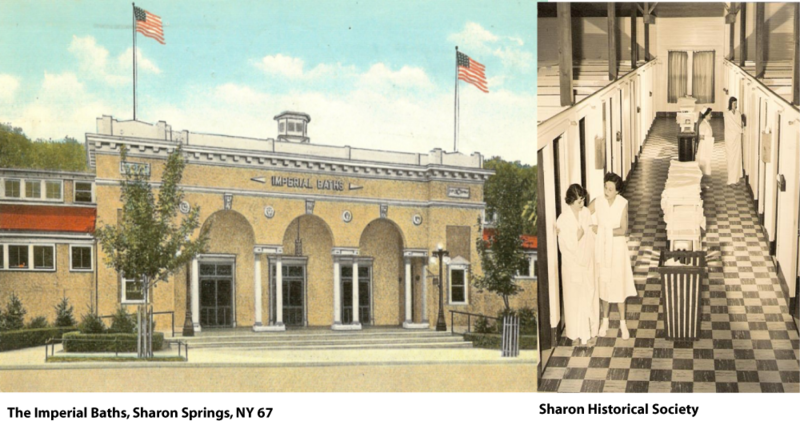 In 1927, the Imperial Bathhouse was completed, offering many of the treatments provided by the older establishments. 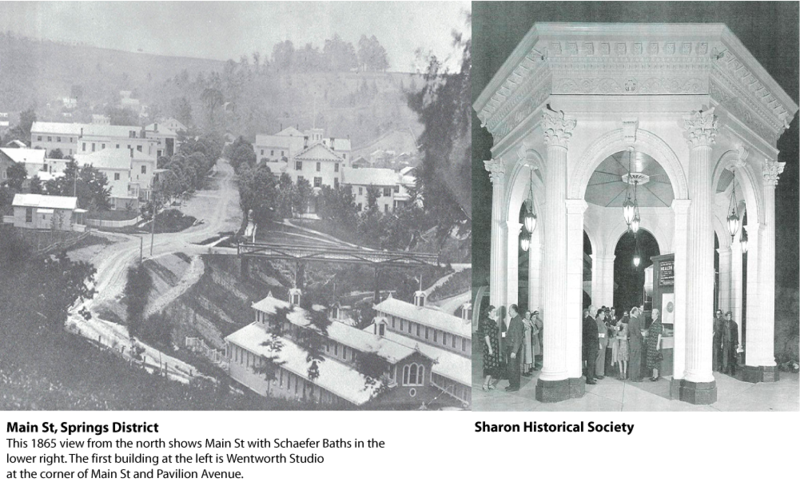 A year later, the Adler Hotel opened with mineral bath accommodations on the lower level for its guests. A few years later, a bowling alley and billiard hall belonging to the Pavilion complex was converted to a bathhouse for the convenience of its patrons. While medical advances have been made in recent years, there are still many who believe firmly in the mineral water’s curative powers. The Direct Inhalation room was located in the Inhalation Bath-house building on Main Street. The inhalation of Sulphur water was considered most beneficial and curative for nasal catarrh and diseases of the respiratory organs. Sulphur water alone, or combined with pine Needle Extract, promised great relief in many cases of sub-acute and chronic pharyngitis, laryngitis, hay fever, and asthma. The small town of Sharon Springs NY was an early destination for wealthy Americans searching for the "water cure," an ideology which embraced natural healing powers of minerals dissolved in naturally occurring springs. Natural spring water was touted as being a cure for various afflictions, including arthritis, rheumatism, stomach disorders, headaches, diabetes, and a myriad of other ailments. In 1927, the Imperial Bath house was constructed on Main St. It provided 43 tubs, private resting rooms, four douche rooms, and four massage rooms. 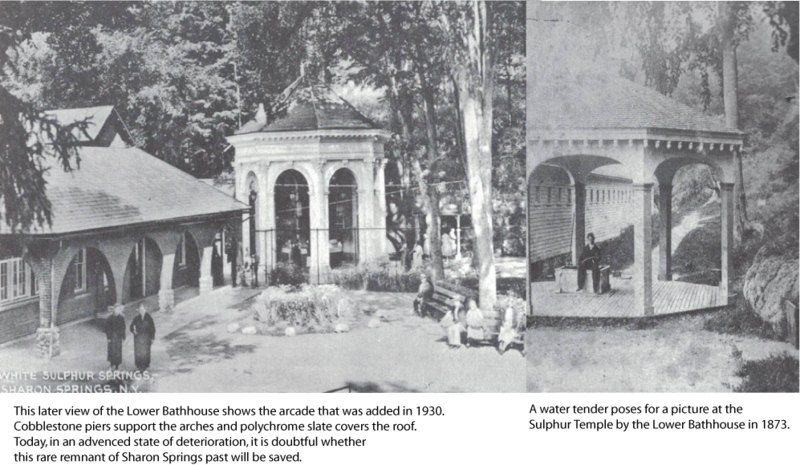 The nearby Lower Bath House (1876) was renovated and given an arcade entrance, and the White Sulphur Spring Temple was given its ornate pavilion which became a symbol for the community. Despite these new amenities, the town fell into decline, although there was a small resurgence after World War II. Here, Holocaust survivors could relax in the baths surrounded by the safety of their German-Jewish culture. Despite this haven, the opening of the New York State Thruway in 1954 diverted traffic from the county road that passed through town and decreased tourism even more, leaving many of the baths and hotels neglected and falling into disrepair. In 2015, We have begun redevelopment of the site. We plan to rehabilitate historic structures at the site that can be saved into a resort spa, and also renovate as the historic Adler Hotel later on. Health spas were renowned as much for their picturesque surroundings as for their waters. Sharon Springs had the luxury of the highest quality mineral waters and exceptionally beautiful grounds, bustling with activity, as well as the fresh mountain air. The fango (Italian Volcanic Mud) mud packs, Sulphur Spring, Magnesia Springs, Chalybeate Springs, and Blue Stone Spring mad Sharon Springs famous the world over. Fango was awarded an Honorary Diploma of Exhibition at Bologna, 1888, Gold medal of International Exhibition at Rome, 1894, and The Grand Gold Medal of the Government of Italy, 1895. The White Sulphur Springs Company of Sharon Springs was awarded a diploma and silver medal for its waters at the Paris Exposition in 1900 and at the St. Louis Exposition in 1904. Then again in 1939, the White Sulphur Company made the spotlight in an exhibit at the New York World’s Fair, which portrayed the waters, temples, and treatments. Arthritic patients sat in a chair to receive hot mud pack treatments. Pictured here is Jeanette Lehman MacBride receiving a mud pack administered by Roger Ingraham, 1939. 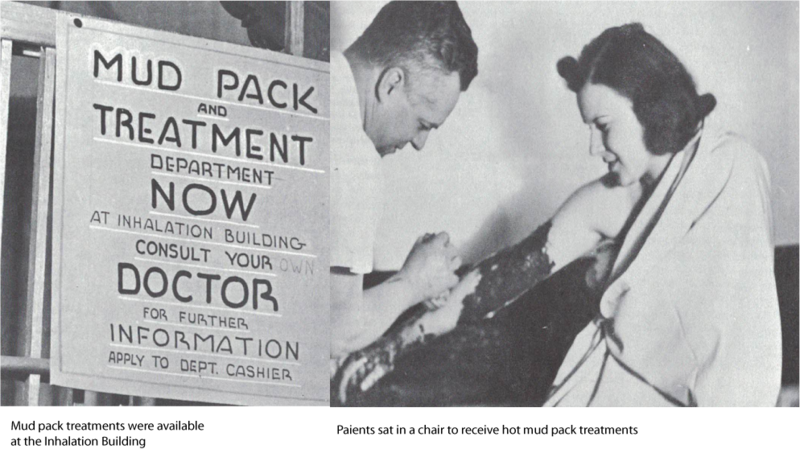 But, these treatments stopped when the mud was no longer available from Europe due to World War two.